Service Tax in real estate is a complex subject and difficult to comprehend by a layman. After discussing this topic with tax experts and going through the information available in the public domain, I am jotting down my understanding of the subject. As I am not a tax expert, there are bound to be some issues in my understanding and I would like the readers to please pass on the feedback so as to make this a more comprehensive note. Service tax on all under construction properties became effective on 1st July 2010. When the Service Tax on under construction property was first levied, many Real Estate Developers and Builders had appealed to the Courts against the applicability of Service Tax on Under Construction Property and the Court had also issued a Stay Order for the same. But, the Courts eventually decided in the favour of the Govt. as a result of which Service Tax on under Construction Property is now liable to be paid. Service Tax on under Construction Property is levied on the Services provided by Builders where Building Complexes, Civil Structure or part thereof are offered for sale but the Payment is received before the Issuance of Completion Certificate by a Competent Authority. *Please Note: Single Residential Unit has been defined as a self contained residential unit designed for use of a single family. If the house/complex has multiple floors/units and the title of each of the units/floors is capable of being transferred to another person by Mutation in land/municipal records, all the floors/units would be considered as separate single residential units and Service Tax on Construction would be levied on the same. To charge service tax @12.36% on the amount charged from buyer on services, provided the value of cost of land and stamp duty paid for registration charges has been excluded. To avail abatement of 75% from the gross amount* charged to the buyer for determine value of taxable services, provided 1) Cenvat credit on input is not taken and 2)Value of land is included in the amount charged from the service receiver. In most of the cases the builder charges the service tax on the basis of option 2. CENVAT credit on inputs used for providing the taxable service has not been taken under the provisions of the CENVAT Credit Rules, 2004. The value of land is included in the amount charged from the service receiver. The total Service Tax in this comes out to be approximately 3.39% of total apartment cost. Earlier there was an absolute bar on availment of Cenvat credit. However, after 1st July 2012, Cenvat credit in respect of capital goods and input services (as defined under rule 2 of Cenvat Credit Rules, 2004) has been allowed. It is to be noted that Cenvat credit in respect of inputs shall not be allowed. A Builder is engaged in providing service of construction of flats. Mostly the builders sub-contract the work of construction to another contractor. In this case Builder is providing output service of works contract/construction of complex service and at the same time availing input service of works contract from contractor. Therefore, the Builder can take the Cenvat Credit on input service and utilize the same in paying its tax liability only for works contract service, maintenance or repair or construction of complex service. After 1st July 2012, the builders continue to charge service tax from customers however; they now avail CENVAT credit on capital goods and input services, thus depositing less service tax. A builder sells a residential flat for Rs. 5,000,000, including land value. After abatement of 75 % ,service tax on 25 % value @12.36% Rs 1,54,000/-charged by builder. As per notification 26/2012 given above, while depositing the collected service tax amount from the consumer, builder can claim cenvat credit on capital goods used and cenvat credit on services . Assuming that input capital goods used and input services received to construct the flat are worth Rs. 1,200,000/- Cenvat credit available to the developer @12.36% is Rs. 1,48,320. Therefore, the developer/builder will be required to pay only the balance amount of Rs. 6,180 towards service tax. After this amendment 26/2012, there is a direct benefit to builder/developer. This benefit will increase / decrease with increased used of capital inputs and Input services in construction activities. In few case nothing is payable by developers. Builder is a big gainer in this case and technically developer/builder should pass on this benefit to consumers. But this is not done!!!! There is also no data available in public domain suggesting the increase or decrease of the service tax collection over the years. Hon’ble Developer, NPR region; Greetings. 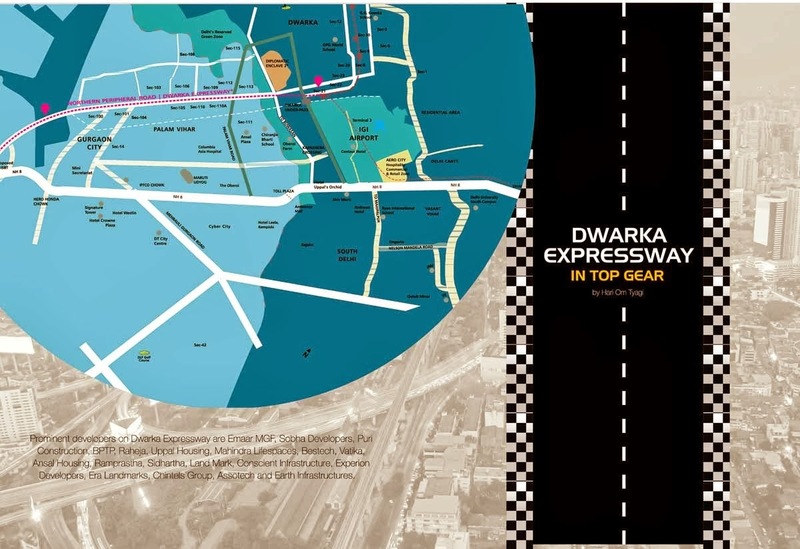 We are pleased to bring another Good News in series related to ROB at NPR / Dwarka Expressway Region. HUDA has given related project to M/s SP Singla & Company and Batching Plant has already been installed. Further, the Tender of ROB is going to get published by Railways in the next around a week’s time. Coming of Good News - one after another in series really proves that all problems at NPR / Dwarka Expressway Region are under control and will soon become History. We thank all our member developers especially Hon’ble VP of CREDAI National - Shri Sanjeev Srivastva for providing continuous support in ROB / RUB related things and hope to receive the same in future as well. दिल्‍ली हाई कोर्ट ने दो साल के लंबे विवाद के बाद दिल्‍ली-गुड़गांव एक्‍सप्रेसवे पर टोल प्‍लाजा को हटाने का आदेश दिया है. बुधवार को कोर्ट के आदेश के बाद अब एक से दो दिनों में अधिसूचना जारी होते ही टोल प्‍लाजा को हटा दिया जाएगा. हालांकि कोर्ट के आदेश और मामले से सं‍बंधित पक्षों में समझौते के तहत कमर्शियल वाहनों से चुंगी वसूलना जारी रहेगा, लेकिन उसके अलग से लेन बनाई जाएगी ताकि आम लोगों को ट्रैफिक की समस्या से दो चार न होना पड़े. गौरतलब है कि इस मामले में नेशनल हाईवे अथॉरिटी ऑफ इंडिया, दिल्ली गुड़गांव सुपर कनेक्टिविटी लिमिटेड, लीड फाइनेंसर आईडीएफसी के अलावा एमसीडी पार्टी थे. इन सभी के बीच समझौते के बाद कोर्ट ने फैसला सुनाया. सभी इस बात से सहमत थे कि टोल को हटा दिया जाए. बहरहाल, विवाद के निपटने से अब एक्सप्रेसवे पर सिरहौल में टोल प्लाजा हट जाएगा. मामले में एमसीडी और एसएमएस इंफ्रास्‍ट्रक्‍चर लिमिटेड ने कोर्ट से हस्‍तक्षेप का आग्रह किया था. एमसीडी ने दिल्ली में एंट्री बैरियर पर इस कंपनी को तीन साल के लिए टोल वसूलने का काम दिया था. हाईकोर्ट ने 12 फरवरी को सभी पक्षों को समझौता करने का आखिरी मौका दिया था. A year after the notification, Haryana government had released around 95% of the acquired land to private builders and even granted licences to some for developing housing projects on the land. CHANDIGARH: The Punjab and Haryana high court on Friday quashed a 2009 Haryana government notification acquiring 1,400 acres of land in eight villages around Gurgaon for developing sectors 58 to 63, in a judgment that deals a big blow to the Bhupinder Singh Hooda government as well as the Millennium City's realty sector. The sectors are adjacent to prime residential areas on Golf Course Road and were to be the bedrock of the next phase of Gurgaon's realty growth. The economic impact of the order is likely to be heavy as several builders had already made investments in the affected sectors. "Prices in the properties that were supposed to come up in this area could range between Rs 7,500 and Rs 12,500 per sq ft," said Avinash Piplani of Aarambh Property Hypermart. Villages whose lands were acquired are Nangli Umarpur, Tigra, Ulhawas, Kadarpur, Medawas, Badshahpur, Behrampur and Ghatta. Justice Surya Kant ordered quashing of the notification following petitions filed by some residents of Badshahpur, who argued that their prime lands were acquired at throwaway prices under Section 4 of the Land Acquisition Act — which has a 'public purpose' clause — and later handed over to private developers. Among builders who have large portions of land in the affected area are Ireo, Krrish Buildtech and Commander Realtors. Other developers in the area include M3M, Emaar MGF, Anant Raj and Nova. A senior official of Haryana's department of town and country planning said the order was a major setback for its plans to expand Gurgaon's urbanscape. "Our efforts of the last three years have gone waste," the official said, adding that DTCP was likely to initiate proceedings to return the land to villagers. When contacted, Hargurpreet Singh, AGM (sales) of Ireo, said, "We are not aware of any such ruling yet and will respond when we get the news." Since September 2009, Ireo has launched at least two residential projects in the affected sectors — The Grand Arch (Sector 58) and IreoSkyon (Sector 60). It's, however, not yet clear whether these projects are on land affected by Friday's ruling. Taking cognizance of the villagers' petition in July 2013, a division bench of the high court had issued notices to the Haryana government seeking its reply. While issuing that notice, the bench had observed that prima facie the facts of the case pointed to abuse of power by the state government in the acquisition and release of land. This is the second time in less than a month that land acquired by Haryana government has been set aside by the high court on grounds of arbitrariness in the state's land acquisition process. On December 19, 2013, the court had quashed the acquisition of around 850 acres in various villages of Rohtak, the home district of chief minister Bhupinder Singh Hooda. Villagers in the area welcomed the court order. "It has come as a big relief to my family and hundreds of other villagers in the area as the land was taken from us in a wrongful manner," said Ved Kala Sharma, who along with her son Devdutt had filed the petition. "I cannot express my happiness in words. I have a joint family and we had just two acres of land, but it was taken from us to benefit the developers" said Devdutt. He alleged that only 87 acres of the acquired land was yet to be released to private developers and demanded an inquiry into the case. Devdutt said he and many other villagers had not taken any compensation from the developers.